Fall is arriving which means it's time to CRANK THAT OVEN! 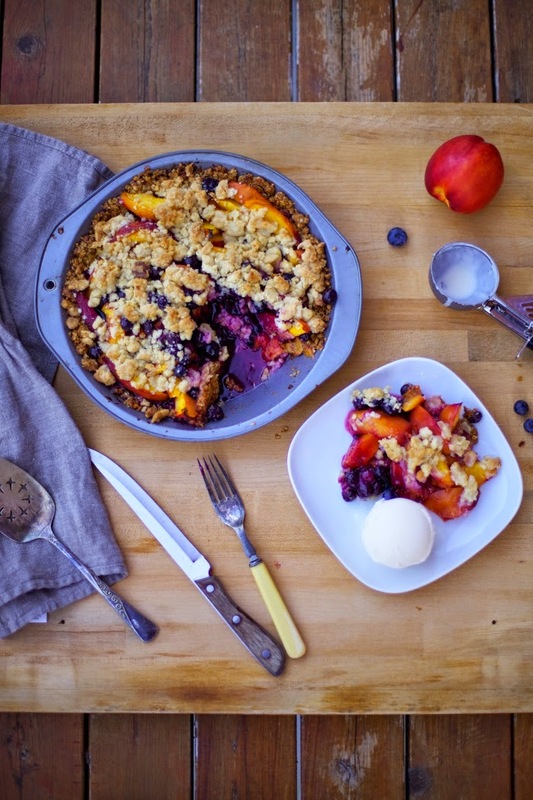 One of my favourite cool weather things to bake and share are PIES, beautiful pies. 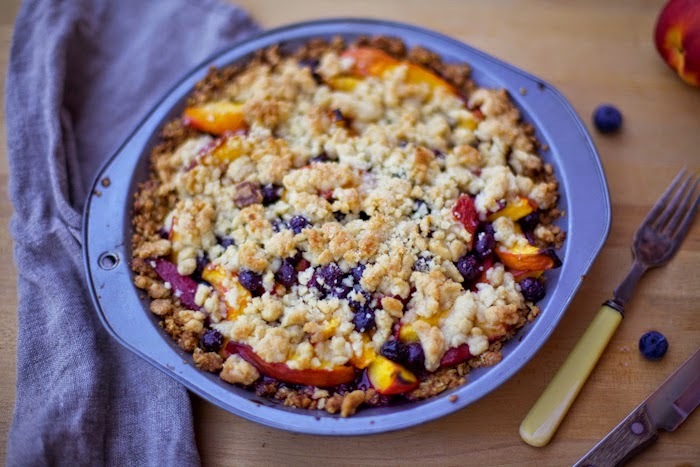 With the last few weeks of summer fruit and a craving for a crumble-like dessert, this easy nectarine and blueberry pie came together like a sweet and salty dream, loaded with fruit, sprinkled generously with streusel topping and served with a perfectly large scoop of vanilla ice cream. 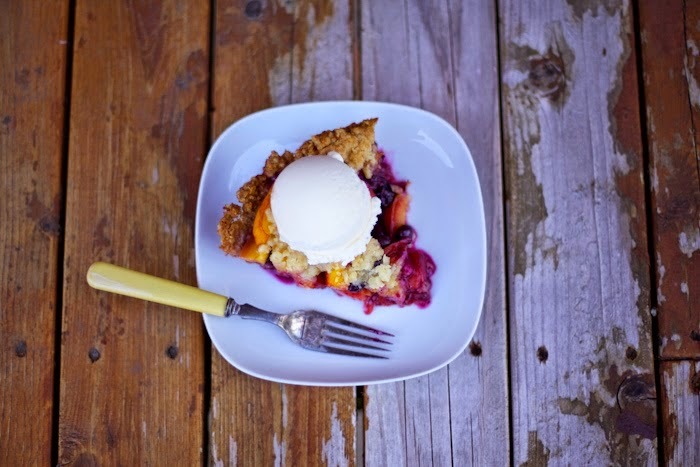 The beauty of this fruit pie is you can substitute fall's favourite friend, the mighty apple, and it will be just as spectacular. So dig in, friends! It's high time for pie! Stir together all ingredients except the butter in a large bowl. Add melted butter. Press evenly into the bottom of your pie pan. Freeze until solid; 15 minutes. Bake on the middle rack at 350 degrees for 18-20 minutes; if it puffs up at all, simply press back into the pan and let cool before using. Mix all of the ingredients together. Place filling into oat crust. Stir together the dry ingredients in a large bowl. Add the butter and mix until combined; it will be clumpy looking. Sprinkle generously all over the fruit filling. 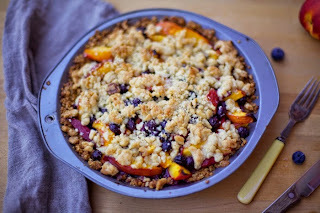 Set the oven to 375 degrees; bake for 40-45 minutes until fruit is happily bubbling and cooked through and the streusel topping has browned nicely. 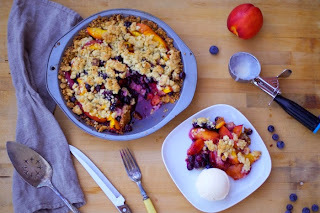 I fell seriously hard for this delicious pie and I hope you will too. 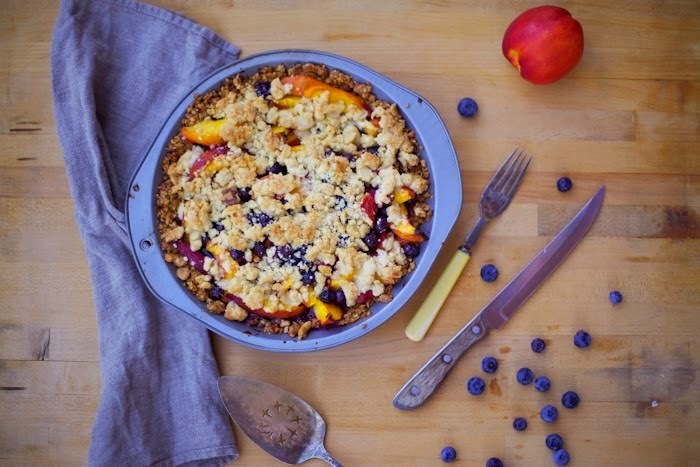 You can also de-flour this beautiful oaty fruity pie by substituting spelt flour for the all purpose flour in both the crust and the streusel topping. Happy baking, friends! This. Sounds. Amazing. I'm saving this one! My dad always made it with peaches. I would love nectarines though! Definitely have to try it out!